I made these two lunches for my teen nephews to take to school. They have similar ingredients but are different. They could be made for the same person on 2 different days or as I did for 2 different people on the same day. I used black beans leftover from dinner. 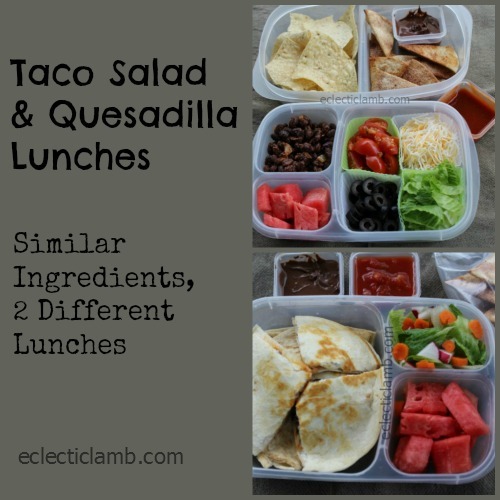 To see 12 taco lunches go here. This lunch was for my 14 year old nephew. He requested a taco salad. I wanted it to be different than the last taco lunch I made for him. I made this lunch for my 17 year old nephew. He wanted black bean quesadillas. I packed a lot of food into this lunch. My nephews enjoyed these lunches. 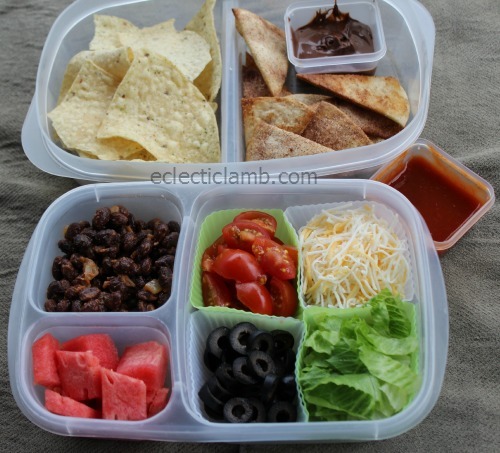 I made these lunches easier but using some of the same ingredients (cinnamon tortilla chips, Nutella, lettuce, Mexican cheese blend, black beans, and watermelon). But I think that they are different enough that the same person could enjoy these meals two days in a row. 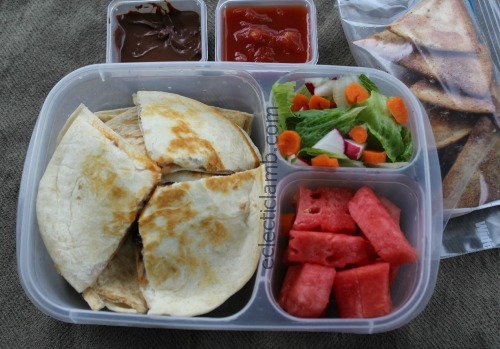 This entry was posted in Bento / Cute Food, Food and tagged bento, packing lunch for teens, taco. Bookmark the permalink. Looks so yummy! You are such a nice aunt! Interesting combinations! Love how different lunches are created using the same ingredients!